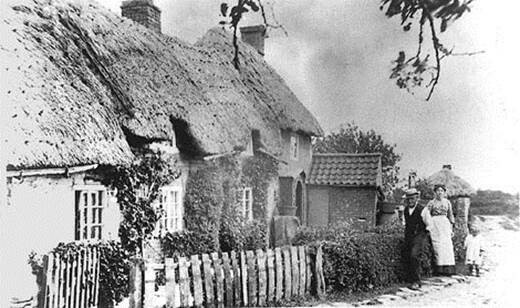 This article is meant as a short introduction to one of the traditions of earth building that is found in Nottinghamshire, in an area to the north of Bingham. This particular form of earth construction is quite dissimilar to the ‘mud and stud’ tradition which is well known in Lincolnshire, and is much more like the ‘cob’ building tradition of the south-west, the ‘Wychert’ of the Chilterns and the ‘Clay dabbins’ of Cumbria. In fact most areas of the UK have some form or other of ‘monolithic mud’ construction at some time or other, and it is largely luck as to whether any examples of these traditions have survived into the 21st Century. All these earth building traditions have a few things in common: They are constructed from local material immediately available in the locality; and the local sub-soils will have a reasonable clay content. The known Nottinghamshire examples are found clustered north-east of Bingham, covering six parishes (see map below). It would seem likely that the tradition continued south of Bingham as part of the same tradition seen in Leicestershire where there are a large number of mud buildings particularly around the Market Harborough area, which continues southwards into west Northamptonshire. 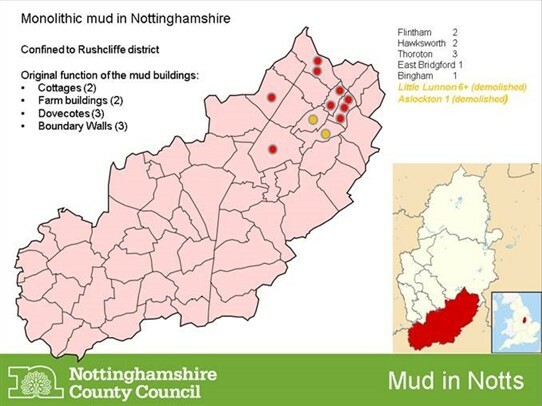 The Nottinghamshire and Leicestershire the tradition tend to be referred to as ‘mud’ building rather than ‘cob’ or ‘clay dabbins’ ,which are terms used in other parts of the country. Of the few examples left in this county, three are dovecotes, two are cottages, there are two farm buildings and three examples of boundary walls. 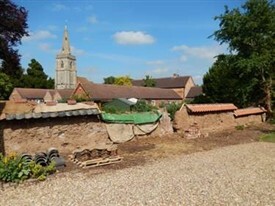 During 2014 one of the boundary wall examples, at the site of the old Manor Farm in Thoroton village, was determined to be ‘at risk’ and this was reported during a the Society for the Protection of Ancient Buildings (SPAB) mud repair event in Leicestershire. 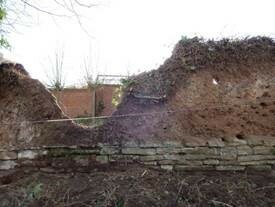 In 2015, Anthony Goode (expert mud builder) offered to assist with the repair of this wall and ownership was investigated. It became clear that the wall was no-longer part of anyone’s land having been ignored during the redevelopment of the farm site for residential use. With the adjoining land owners’ agreement a working party of interested members of Thoroton village were brought together at the beginning of 2015 to clear ivy before the bird-nesting season. 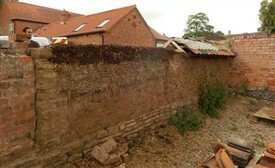 What followed was a remarkable phase of community activity, led by Anthony Goode (of Slawston in Leicestershire) and Alex Gibbons (Earth Building UK education officer), and also assisted for one week by the SPAB scholars, that repaired and saved the wall over the space of the summer months. This mud wall had been recorded as ‘Smite Farm’ by the archaeologist John Samuels and reported in the Transactions of the Thoroton Society in 1980. Although the record was not particularly extensive (and there are no photos in his report) it is clear that the thirty five years had not been kind to the wall! Samuels’ drawing of 1980 imply that the wall was over two meters tall along its full 20 metre-plus length and that it had a pantile capping along its entire length. By 2014 this capping had disappeared for the most part and in its place there was a thick growth of ivy along the whole length (see plate 1). Mud walls do not function well if they are allowed to get damp, and although the ivy was providing a rain cap of sorts it was also growing through the wall in places, destabilising it to the point that collapse was likely and imminent. Following the removal of the ivy it was imperative that a proper capping of pantiles was reinstated as soon as practical. At this point Anthony Goode once more came to the rescue offering to supply the pantiles he had stored at a farm in Leicestershire which he needed to clear out. The removal of the ivy allowed the wall to be fully recorded on both sides and revealed some interesting information about its likely origins. Although the wall is neither ‘listed’ nor in a conservation area the drawings were supplied to Rushcliffe Council conservation officer for his agreement prior to the repairs commencing. One section of the wall may have been part of a complete building, the western end was demonstrably of earlier age than the rest of the wall. It appears to form the southern part of an agricultural building that is shown on the early C20th OS maps. At some point a door opening had been put though the wall and further to the east a heavily eroded section marked the location of a cut-through that some villagers recalled using as a short-cut to church before the 1990s housing development cut off this access route. The repairs involved consolidating the wall down to a level that was stable enough to carry the roof of mini-trusses and pantiles. Several drops in height were used to ensure that as much of the original mud material was retained as possible. The sections that were taken down were put to one side and incorporated back into the wall as part of the new earth mix. Subsoil was tested from various locations offered by a village farmer, Richard Ogdon, and the chosen soil was delivered to site by him along with straw and hay. The wall is conveniently located next to an access track leading from Main Street to fields to the east and this provided the space needed to do the mixing. Mixing earth is hard work but straightforward enough if you have enough volunteers of any age (see picture) with wellies and strong legs! Plenty of water and straw is added to the mud mix to reduce shrinkage and increase its strength. The mud mix was lifted onto the low Blue Liass stone wall that acted as a plinth or on top of original mud wall and knocked hard with a garden fork to secure in place. The wall face was then trimmed with a sharp billhook or spade and the whole wall was treated to a good coat of a fine mud plaster (mixed with hay rather than straw). Thoroton mud wall project was a great example of community coming together to recognise and protect its local heritage. Over the course of the summer lots of people gained an insight and appreciation for one of their vernacular building traditions and were even able to identify new, hither to unknown examples in the village as the knowledge spread! This page was added by Website Administrator on 24/01/2017.